I have this phone about 3 mounths ago and what can i say? it's a brilliant smartphone. he looks very very well, games like fruit ninja, temple run, pes, fifa, nfs works perfectly without problems, of corse if your l7 is optimized for free ram memory. Per total this is the perfect smartphone. Ahmed, 14 Dec 2012Guys pls tell me , is this phone laggy and slow or run quickly ? Does it have any other prob... moreThe overall is good, but not a good phone for the 2g internet users. AnonD-90278, 17 Dec 2012Now I see why its cheap. 1GHZ Adreno 200..Thats a deal killer. All those other good specs then... moreThis 1GHz processor is a newest version, model MSM7227'A'(wghich has a letter 'A' at the back),unlike the old MSM7227. The Adreno 200 is also the enhanced version, not the original Adreno 200. Please read carefully before you comment if you ahvenot owned one to see for yourself. I love this phone so much ! It is very cool and the price is also good for what the phone offers . The phone looks very very good on white . I like how it moves and how it works . The screen is great and big . This phone is not for noobs how are suffering for performence like the ones how left comments here for example : " it has only 1Ghz Cpu and Andreno Gpu bla bla bla . I am realy happy with this phone and I almost forgot ... It is slim and easy and it is very stylish . So for those how are looking for a good phone with large display , ICS , NFC , good camera etc this is the perfect choice !! Now I see why its cheap. 1GHZ Adreno 200..Thats a deal killer. All those other good specs then you see this '1ghz cortex A5-Adreno 200'!!! Miikoo, 15 Dec 2012Can this phone cam. read Barcodes? ?WhY not? Install bar code reader from android mkt. who is better? 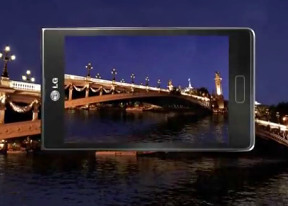 the LG optimus L7 or the LG optimus Black? Can this phone cam. read Barcodes?? Ahmed, 14 Dec 2012Guys pls tell me , is this phone laggy and slow or run quickly ? Does it have any other prob... moreNot too slow but not very fast. 512ram is enough for basic apps. If you wanna run heavier things like games, you'll need a phone with 1GB of ram at least. Guys pls tell me , is this phone laggy and slow or run quickly ? Does it have any other problem ? I was looking for a midrange Android phone (under $300) and I was trying to decide between Xperia U and LG Optimus L7, and I decided this one because of the microSD card feature and the screen size. - Very clear and fair-sized screen. Brilliant colors and definition, it was better then I expected for a midrange phone. Also, the screen is GorillaGlass, so it's difficult to get scratched. - The android UI interface is very well designed, I like it more than the Galaxy's. It has some interesting features like hand-drawn memos and other cool details. - The plastic body is resistant enough, I have accidentally dropped it twice it and had no problems neither stratches. - Touch screen works perfect and fast. - Speakers volume is ok.
- Battery is better than I expected, it longs the all day long with common usage, and up to 5 or 6 hours with heavy usage. - Wifi and data work perfect and fast. - I love the design: square borders, fair size and slim body. - Only 512ram get be a bit slow if you have many apps. I recommend to install some app to auto-kill processes and free ram. - Camera is a little bit crappy. The resolution is not that bad, but the lens material is very very weak so it gets easily scratched and your photos will look blury. I recommend using a transparent protector on it (even if you have a case). - Only 4gb of internal memory may be not enough if you have many apps that storage things on the internal memory. Also, the android version of this phone doesn't let you move apps to the microSD card, so you might run out of space is you have many heavy apps. If you're looking for a midrange Android phone with a good screen for reading and a decent battery duration, this phone is highly recommended for you. If you are looking for a phone for gaming (or whatever that recquires higher perfomance) and high-quality photos,I recommend you to look out for other options. i am currently using this phone and it dont let me download apps from playstore it always stop when it is installing and a error message pop up it would always be invalid package data or insufficient storage available. i checked i have enough storage but it always said insufficient storage available. I cant move my apps into sd card even if i use apps2sd by sam lu.